Not so long ago, the workplace was a bit like a car: essentially about getting you from A to B, with varying degrees of comfort, efficiency, reliability. Budget and aesthetics aside, the main components are pretty similar whatever model you pick – be it a Tesla, Land Cruiser, Ford Mustang or Honda Civic, all have 4 wheels, somewhere to sit, an engine of some kind, and would usually get you where you want to go. The office was pretty similar – it was mainly about providing a space for staff to carry out process, with the layout mainly a choice between open plan desks or offices or cubicles, and the aesthetics and comfort level came (as with a car) largely down to budget. The shift in focus from process work to knowledge work, with increasing emphasis on greater innovation and creative thinking. Ever-present change, with no industry immune to disruption from previously unimagined quarters. A demand for more collaboration and teamwork – both physical and virtual. The search for meaning and purpose: work aligning with personal values and vision. And finally, the impacts of technology, be it simply freeing people from being bound to a place by storage and filing needs, to transformational use of VR or AR. For a while, people expected the death of the office: with the right technology, no need to have everyone housed under one roof in expensive real-estate. Let them all work at home or from cafes. Telecommuting was the answer – no more need to sit in traffic congestion, so better for efficiency, better for the environment. But it turns out that, while some degree of remote working is good (studies have found productivity gains of 35-40% from flexible working), people do need to come together face to face. The office, it seems, has a bigger role than just being 4 walls and some desks. It is a form of identity and social contact that people need, as well as a locus for innovation – something increasingly crucial to a company’s survival. While Amazon and Apple embrace the idea that a fair chunk of their workforce can be remote, IBM announced in 2017 that a large portion of the organization would need to come back to the office in order to boost innovation. John Sullivan, professor of management at San Francisco State University, posits that the importance of innovation far outweighs productivity gains from remote working, and that for innovation to really work, people need to be working together in person (read more here). Facebook and Google, with their ever-expanding campuses based on huge open floorplates argue this is to ensure staff feel connected to each other and can innovate and collaborate easily. All of these factors contribute to a much more thoughtful approach to determining the purpose of the office and what it might look like. 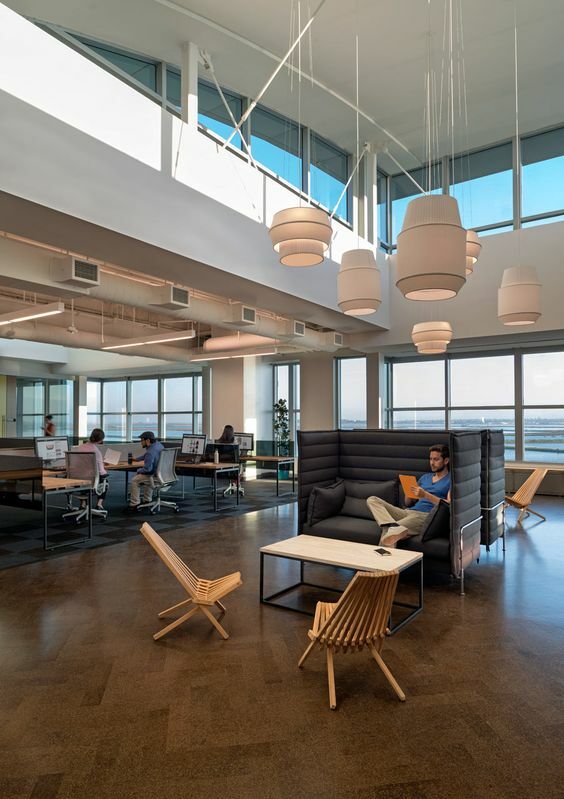 Rather than just following trends, companies are being far more strategic about what style of working, and what (if any) type of workspace is relevant to them and their future needs. From a design perspective, these are exciting times. Where clients have always had diverse needs, that is now coupled with a growing recognition of the importance of workplace strategy in aligning the workplace with long term business strategy and vision. Creating a workspace today is as much about envisaging the destination and describing the journey as it is about choosing a mode of transport to get there. A version of this article was first published for Stack in October 2017. Imagine if, at the end of the work day, you feel calm and on top of things, mentally clear and ready for everything you do after work. Physically you feel energised, relaxed, and healthy. And imagine if that is thanks not only to your personal effort (kudos to you if it is, though! ), but due to fact that your physical work environment, and the culture you work in, actively supports your health and wellbeing.